The Fender Wide Range style humbucker is an important part of many Fender guitars that incorporate a humbucker in their design. 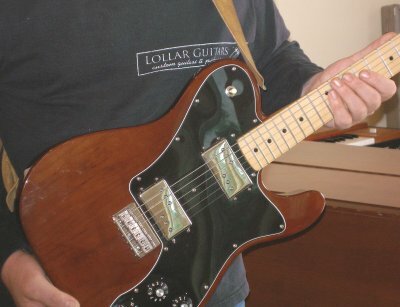 In 2004 Fender re-issued a number of guitars that use the wide range humbucker, including the Telecaster Deluxe, the Telecaster Thinline, and the Tele Custom. These re-issue era Fender wide range humbuckers are different than the original Fender wide range humbuckers – in terms of internal construction and sound. 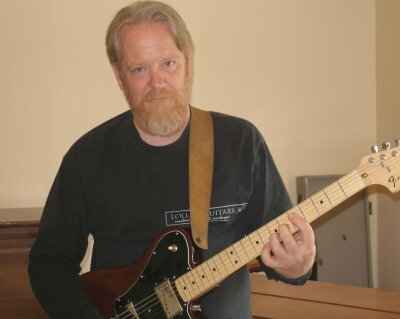 Jason Lollar with prototype Wide Range Humbuckers. These will soon be available with your choice of nickel, chrome, or gold covers. After several years of research (and debating if the cost of tooling would be worth it), we’ve come up with a reproduction of the wide range pickup that sounds and functions almost identically to the originals. In fact, we actually prefer ours. The Lollar version of the wide range humbucker style pickup sounds a little bit clearer than the vintage version. Partly because our pickup covers are made out of slightly thinner material, which reduces the dampening of tone that metal pickup covers can sometimes cause. The original Fender wide range humbuckers had the same winding specs for the neck and bridge. We’ve decided to vary ours a little from neck to bridge, for better volume and tone balance. These Lollar wide range humbucker prototypes have been developed and tested extensively. They will go into production in a few short weeks. We make the custom sized bobbins in our shop. The covers, base plates, lead wire, and magnet wire are made to spec for us in the US. Our new covers will be engraved with the Lollar logo and will be available in nickel, chrome, and gold. The new Lollar wide range humbucking style pickups will likely be available in early September. Make sure to watch this blog for more information – we will announce when they are ready for purchase. Lollar wide range humbucker neck, clean. Lollar wide range humbucker neck, dirty. Lollar wide range humbucker neck and bridge, clean. Lollar wide range humbucker neck and bridge, dirty. Lollar wide range humbucker bridge, clean. Lollar wide range humbucker bridge, dirty. Sound File Gear: Clean files were played on a Fender Princeton – 12″ speaker. Dirty files were played on a 65 Amps London – color channel with boost. The pickups were installed with 250K pots (stock on reissue).